China is again in the headlines with fears of lower growth– this will happen for sure, but the long-term change in consumption in China becomes a much greater challenge. On January 2nd, Tim Cook, CEO of Apple, warned about declining earnings due to lower sales in China. Since then, a new fear for China’s economy has found its way to the financial markets – but is the headwind in China’s economy larger than in many other countries? 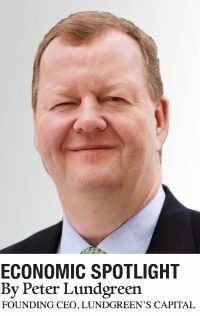 Or rather, is the downturn in China, that Western CEO’s increasingly fear, an expression of a shift in demand in China that has a potential to become really difficult to handle for Western companies? From 2015 to 2017, the sales of iPhones fell from 58 million to 41 million, whereas Huawei’s sales of smartphones in the same period increased from approximately 63 million to about 90 million. During the same three years, the sales increased significantly for producers Oppo and Viva. Xiaomi explored some swings in the sales, but the number of sold units in 2018 probably match the sales in 2017, which I expect is the same with Huawei. During the first three quarters of 2018, Apple only sold around 24 million units in China. It’s obvious that last year offers yet another decline for Apple’s sales of smartphones in China. I will give Tim Cook much credit that Chinese consumers have a more reluctant behaviour than they have shown earlier. Since the middle of last year, I’ve been hearing about consumers who don’t think they can afford an iPhone, which fits well with the lower demand for iPhones. During the second half of 201, it also became clear that it would be the first year in 30 years that the sales of new cars fell. But there is also another explanation, as Chinese consumers are increasingly doing what Western consumers do – buying a used car. While the new car sales fell from 24.7 million in 2017 to 23.7 million units in 2018, the sales of used cars rose from 12.4 million to approximately 15 million during the same 12 months. The GDP growth in the fourth quarter last year was 6.4 pct., as graphic one shows. The trend towards lower growth is expected, and of course has several reasons. If the US trade war has really hit China, then it should have been more explicit to observe the GDP growth. However, it is my opinion that the technology sector has felt an effect from the trade war, which is one reason for general lay-offs in the sector. Further, the Chinese government is still working on reducing the debt burden in the economy that is equal to a deleverage of the economy, i.e. it lowers the GDP growth. The described cautiousness among consumers naturally plays a role for the growth as well, but graphic two paints a very different picture. 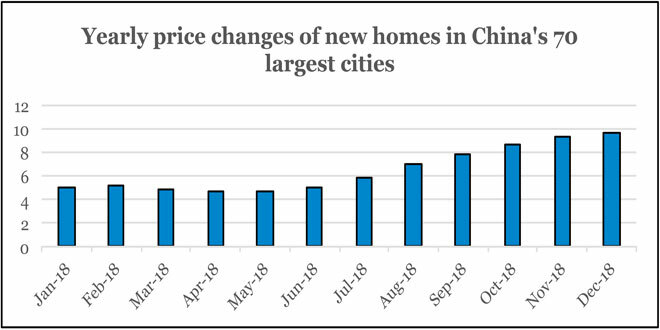 With almost infinite price increases for new private homes, one could be tempted to ask whether the Chinese consumers haven’t understood that their country is heading towards an economic crisis according to the financial markets? It is my expectation that the housing prices will soon turn negative as the annual increase in sold square meters is now approaching zero. Sales in the traditionally good autumn were also rather sluggish. Overall, it fits well with my expectation since mid-last year that the GDP growth will drop to six pct.- somewhat faster than what the financial markets expect. The downwards pressure on the economic growth will ongoingly lead to volatility in the stock markets, but the challenge for Western companies and investors is whether it really is the biggest risk to be afraid of? In five years, China’s total GDP is after all expected to be 30 pct. larger than it is today, while for example, Italy’s GDP remains the same, due to zero growth, if the country is lucky enough to avoid a recession – which development represents the biggest risk? The continued relatively high growth in China is one of the several arguments as to why China offers interesting growing purchasing power- more millionaires, billionaires, etc. – i.e. a market that grows, but is increasingly difficult to access. I argue that the current development supports the long-term assessment we in my firm have long considered as the main scenario. The escalating focus on domestic growth in China generates the world’s biggest single market within the next decade, and it will be on China’s premises, regardless of Trump’s trade war or not. I believe that the signals of changed consumption behaviour in 2018 will be amplified over the next few years. It corresponds with my trust in a strong megatrend of the purchasing power in middle class households in all Emerging Markets countries. In particular, the upper middle class in Emerging Markets countries (including China), will not experience any particular improvement in their purchasing power moving forward. On the other hand, households with very low incomes will move up towards the middle class, measured in terms of income. It is the underlying long-term reason why the demand for iPhones does not increase. Instead, products that can compete with local cheaper Chinese products will be in demand. More consumers will buy a used car, and the increase in sales of, for example, durable consumer goods, will predominantly be plain and cost competitive products. 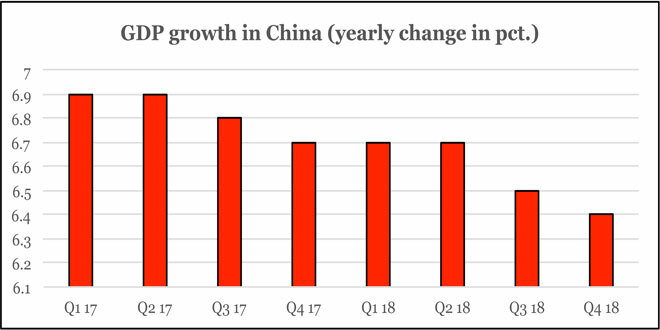 I expect that this is the pressure companies will experience in the Chinese market many years ahead, and therefore it is not a drop in the GDP growth to six pct. that would be my main concern.